1. Connect the first jumper cable to your vehicle's battery terminal. 2. Connect the other end of the first jumper cable to the assisting vehicle's terminal. 3. Connect the second jumper cable to the assisting vehicle's terminal. 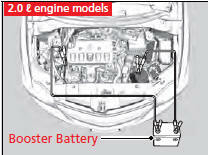 A battery can explode if you do not follow the correct procedure, seriously injuring anyone nearby. Keep all sparks, open flames, and smoking materials away from the battery. 4. 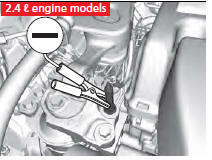 Connect the other end of the second jumper cable to the engine mounting bolt as shown. Do not connect this jumper cable to any other part. 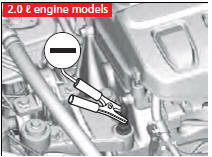 Once your vehicle's engine has started, remove the jumper cables in the following order. 1. Disconnect the jumper cable from your vehicle's ground. 2. 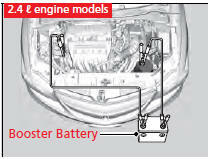 Disconnect the other end of the jumper cable from the assisting vehicle's battery terminal. 3. Disconnect the jumper cable from your vehicle's battery terminal. 4. Disconnect the other end of the jumper cable from the assisting vehicle's battery terminal. Have your vehicle inspected by a nearby service station or a dealer.